I think that buying new is good for businesses and for people who can’t or won’t maintain their vehicles and need that shiny new reliability. I don’t think that homestead vehicles need to be new. In fact, it’s great if they have little or no computers in them. The homestead vehicle should be easy to maintain, able to travel the local geography in all weather and do all the jobs required. A new rig can do these things, but a used rig can as well, for a lot less. Some of my bias is going to show, because I love junkers. I feel that a vehicle that costs $1,000 can be renovated for another $2,000 and will often last for years. I use this excuse to buy and sell cars and pickups. I’d like to go over what I have now and what its purpose is. First is the 1999 F150. It’s got four doors, a long bed and a lumber rack. You can see one problem I have with the F150 in the pic above. The springs in the back aren’t stiff enough. I’ve purchased overload springs but haven’t installed them yet. 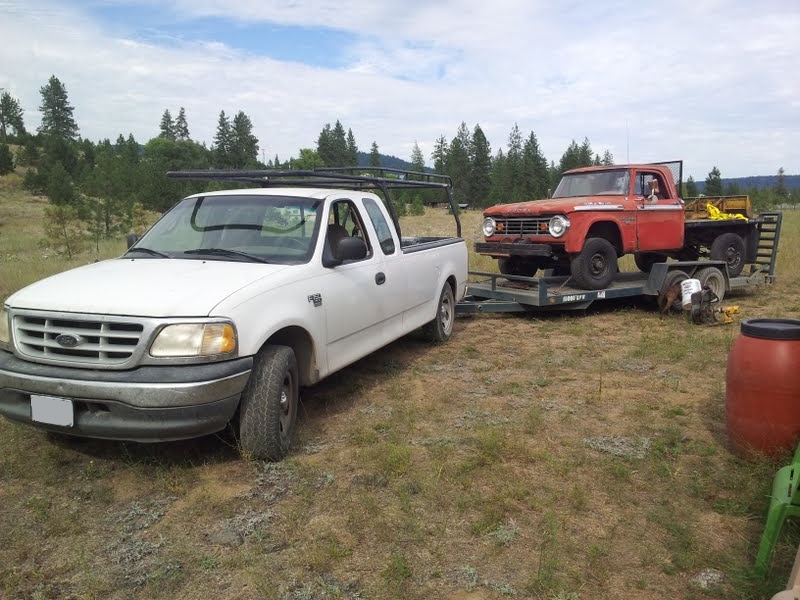 The second problem is that it’s a two wheel drive pickup. Just this morning, I was fish-tailing around in a snow storm. This gets old. I’ve had to put on chains to get to the homestead while four wheel drive rigs blow by me. I hate putting on chains. 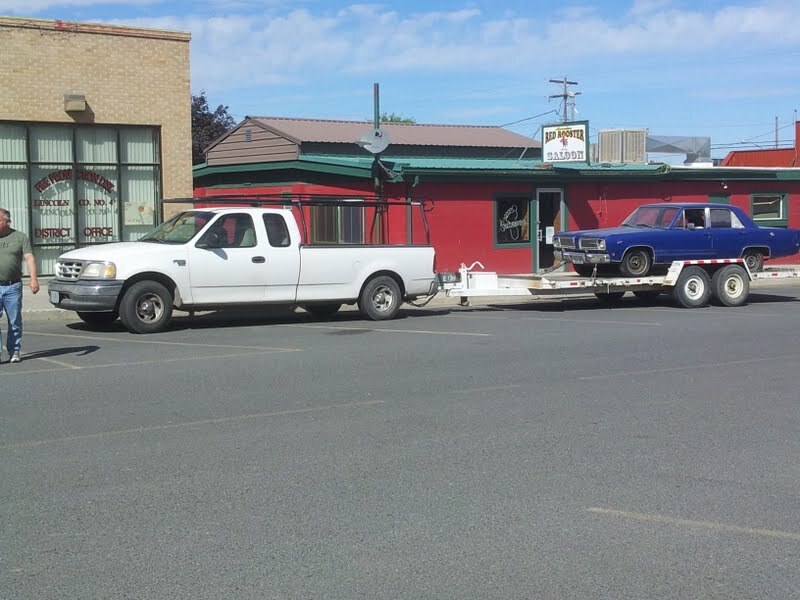 In case you’re wondering about the car in the pic, it’s a ’68 Valiant that was purchased by one of my kids. She bought it using money from working on the homestead last summer. Since it’s hers, I’m not including it in my list. 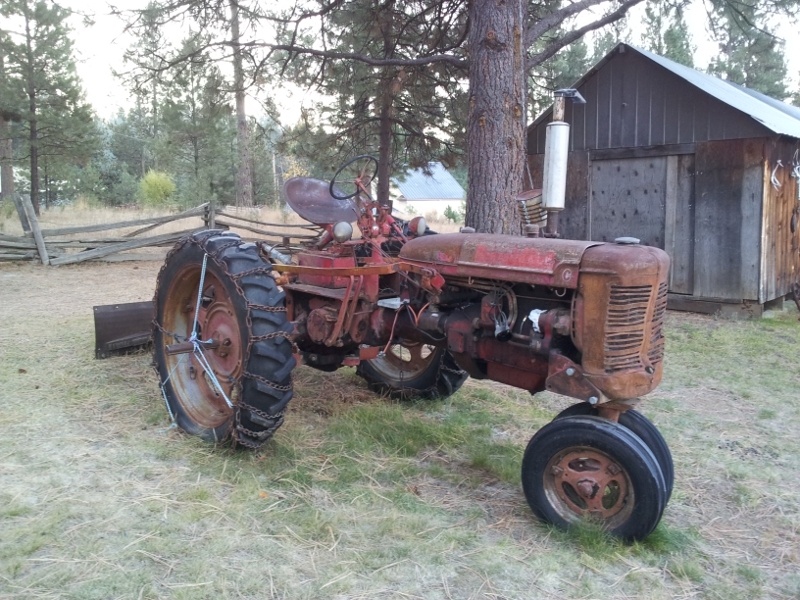 There are good things and bad about this tractor. The price was great and it’s has been a good adventure with friends. Obviously it’s not all work with the ‘Cat! I can’t wait for spring! I’ve put a winch on the front bumper since this pic was taken. I’ve put about 200 miles on the Scout in the city and in the country. The engine is developing a serious knock. I paid less than $1k, I’ve given myself a budget to get it running better than ever. The budget includes the next rig. I purchased the blazer for $1k. It’s a donor vehicle. I’m planning on pulling the body off, shortening the frame and sticking the scout body on it. I’m going to get a lot of hate from Scout lovers and Blazer lovers alike. The blazer has a good bit of body damage on the other side. The heat and speedo don’t work. The seat are trashed there’s no back seat. The wrong kind of headers were put on, so the drive-shaft for front wheel drive was unhooked. The good news is that the carb and intake have been upgraded. I’ve put about 700 miles on the blazer and it continues to run well. The drilling rig. 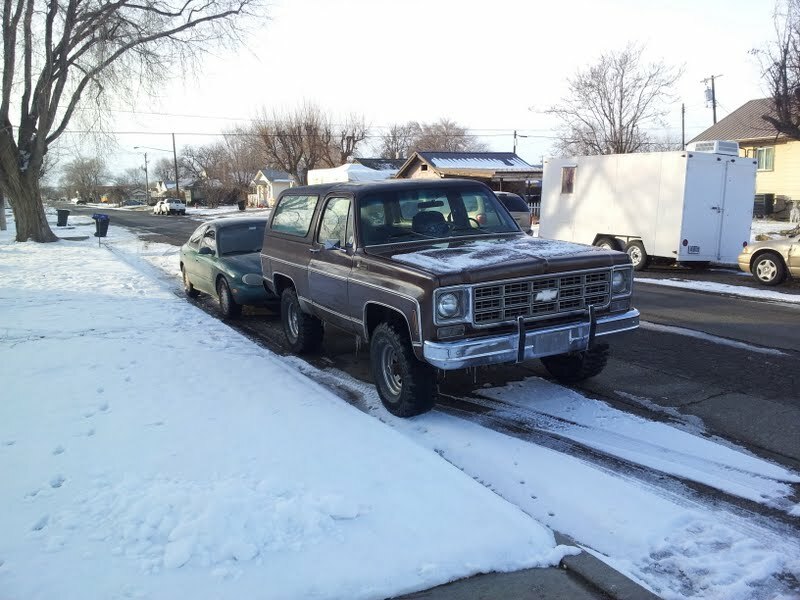 I bought an old Dodge PowerWagon. Its purpose is to be a platform for drilling water wells. It doesn’t have brakes and a lot of other things. It drove onto the trailer and drove off. I’ve begun the rewiring process. I paid $300 for it. I could get my money back by recycling it. I don’t want to do that–I think the rig will be very useful. The toy. I’m a contractor, so I do a lot of traveling. I drive when I can. I get reimbursed for mileage, which means I can use that money to pay for my car addiction. I wanted a car that would be economical and would be fun enough to keep me awake. 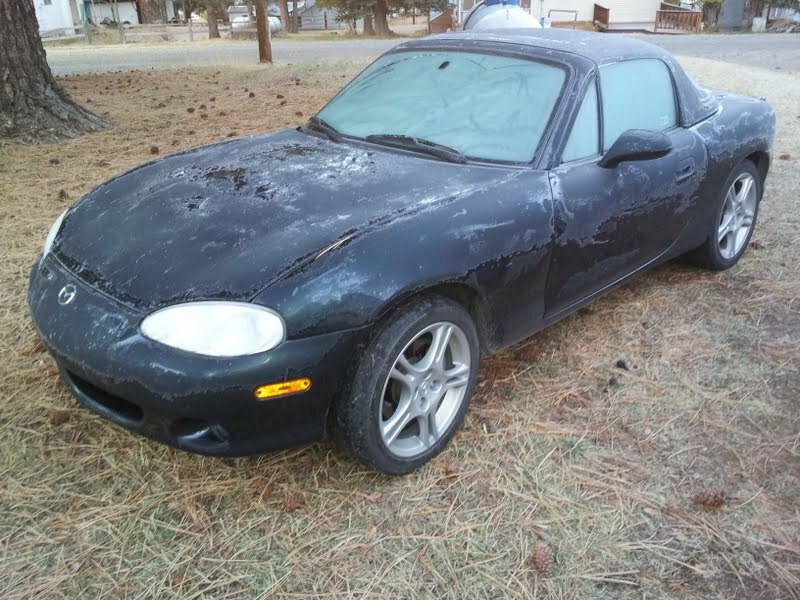 I ended up with an ’05 Miata. What a car! I can’t say enough good things about it. The only downside is winter driving. It’s rear wheel drive and that makes it squirrelly on slick surfaces. It doesn’t weigh much either, so traction can be an issue. This is the only vehicle I have that is financed. I bought it last year. I think that this pic was taken in September. The elevation was high and the result was frost in the morning. 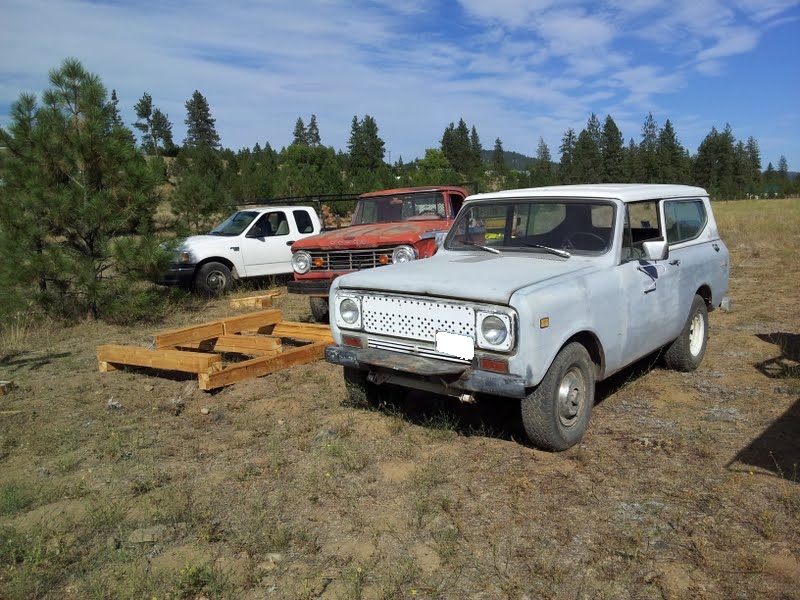 My wife has a car and a project pickup of her own as well. 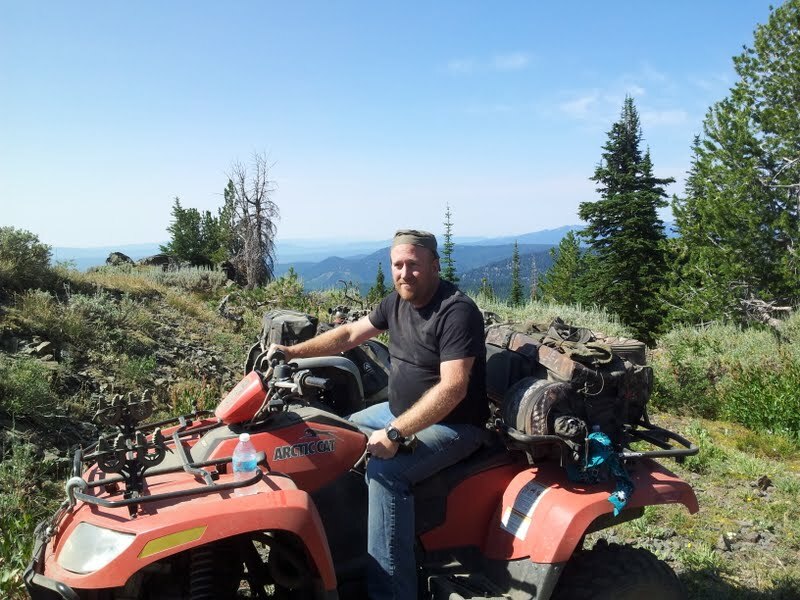 This entry was posted in Tools and Equipment and tagged arctic cat, atv, blazer, car, miata, pickup, powerwagon, scout, vehicle by admin. Bookmark the permalink.